Property 43: Noba Hof - Farm "Noba Hof"
Where do we start? Gorgeous house. Beautiful,clean, well designed, spacious, airy and very relaxing. All amenities were top-notch. We all had a lovely time staying at this house. Even with other houses in the vicinity, it's location provided large bright windows, sliding doors and easy to control privacy blinders. The views includes glimpses of Mt. Rauschberg. So dramatic on rainy days and sunny alike. This place is a hidden gem in Ruhpolding. 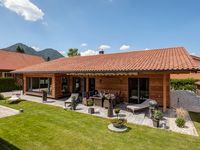 It is a walking distance from the town center and BEST of all walking distance to great hiking trails, meadows, a lovely character-filled chapel and full view of the Chiemsee mountains. Fantastic!! Even our baby loved this scenic house and memorable stay!! Thank you! !